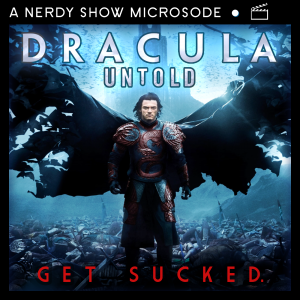 By listener-request we’re investigating the curious case of Dracula Untold – the 2014 film that puts a supernatural spin on Vlad the Impaler’s real world origins and would have been the first installment in Universal’s ill-fated cinematic universe of movie monsters. Does this new spin on a classic have enough bite to hold up against our refined tastes? Join Cap, boR, Doug, La Valle, and Chrystal as they sink their teeth in – either as a Microsode or with our full-length film commentary! We explore the background of the film’s controversial tagline, “Get Sucked”, and explore what would have been for the Dark Universe: why Dracula Untold became disavowed, how The Mummy put the nail in the coffin, and the ways that, in spite of everything, this surprising film might live again. Plus: our spontaneous creation of the most brilliant candy you’ve never tasted. Thanks Chief of Stuff for requesting this Microsode!